As rugby fans pray for a fully-fit, injury-free AB team to take on the world, I’m thinking about one of our legendary players, the full-back George Nepia. In his biography, written with Terry McLean, George tells of an injury that threatened to end his career. In 1925, the North Island were playing the South, and during a tackle, a player struck George’s thigh and burst a blood vessel. Over the next couple of weeks, George had physio to relieve the haematoma but it didn’t work. He couldn’t play. A doctor wanted to operate, but George refused. Instead, George and his team-mate Lui Paewai, went to see Lui’s mother, near Dannevirke. She sent them into the bush to collect two big sacks of kowhai bark, from trees facing the sun’s rays. The bark was cut into strips, hammered, then boiled in a copper for three hours or so until the water had turned dark tan. This was ladled into a bath and once the temperature was right, George lay in it for a good hour. Then Mrs Paewai inspected his discoloured leg and nicked all around the thigh with a shard of broken bottle. More hot kowhai water was added and George stayed in the bath another hour. The water darkened, and dark blood oozed from the cuts. Mrs Paewai was thrilled “ Kua pai tou waewae” (Your leg is better). The physiotherapist was ecstatic – he had thought George’s leg was in such a bad way that his career was finished. “Not with Maori methods”, records George. Just a week or so later, George played for his Hawkes Bay team against Taranaki, winning 28-3. Kowhai (Sophora spp.) has a formidable reputation as a healer of wounds, fractures, sprains and for heavy bruising and internal bleeding, such as George Nepia suffered. Maori crushed the bark and leaves, steeped them in water and applied as a pack to the affected part. There are many records of such kowhai poultices being used to help heal fractures. 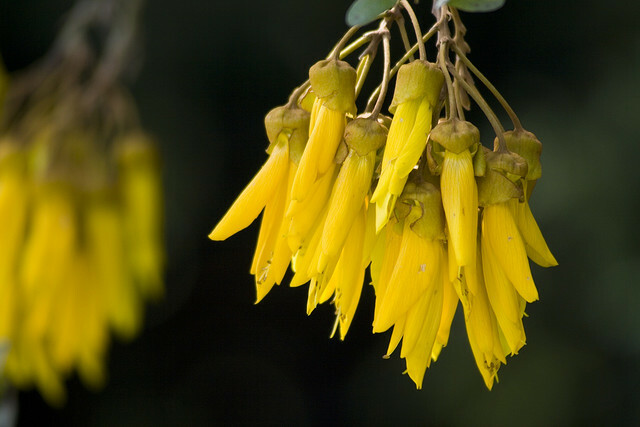 Water from the steeped kowhai bark was drunk to relieve sore throats and colds. An infusion of the flowers and leaves could be taken to induce vomiting. Manuka bark was commonly used with kowhai. Bark from each plant was pounded and boiled and the lotion applied to painful areas such as a sore back, or drunk for internal pains. The liquid was also poured over wood ashes, which then set and dried. The ashes were rubbed onto the scalp for dandruff and to cure ringworm. To relieve headaches, the skin was scored with a sharp instrument and ashes were rubbed into the cuts. Best to stick to aspirin for a headache! But perhaps the AB medics should have a bag of kowhai bark on hand to cure the inevitable bruises, bleeding and broken bones. This is a really great series you’ve been writing Sue – really informative. Thanks.